Had a little go at installing the diesel powered heater for the cab. One of the only draw backs of an air cooled engine i have found is the lack of hot water to heat the cab, this makes it necessary to install a Webasto diesel powered heater for heat in the cab. This system has a great upside in that it can be used with the engine not running and it can be programmed to come on and off at any time, you can also switch it on and off from you mobile phone. 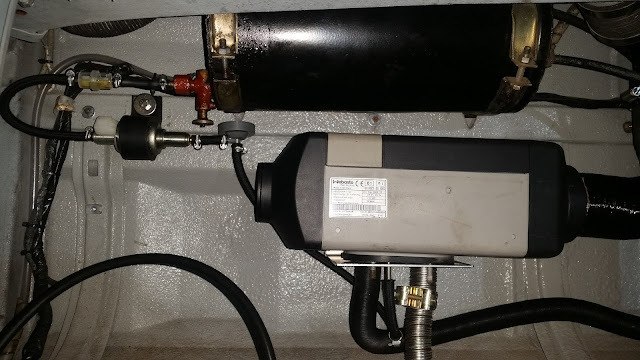 there is a small diesel tank just above it that holds 5 liters, enough to keep it running fore several days, this tank is automatically topped up from the fuel system when the engine is running. The fuel goes from the tank through an in line filter to the dosing pump then to a damping valve before going to the heater unit. There is a exhaust from the heater that just drops down under the truck and a combustion air intake that is piped from the front of the truck. The unit has a hear output of 2000 watts, more than enough to keep you toasty on even the coldest days.